Way back when I was nursing my little one, I would pore over blogs and want to make everything I saw. I really just couldn’t find the time to sew much though, and besides, I didn’t want to make something I wouldn’t fit for long. I would just read and read and read, and pin and pin and pin! 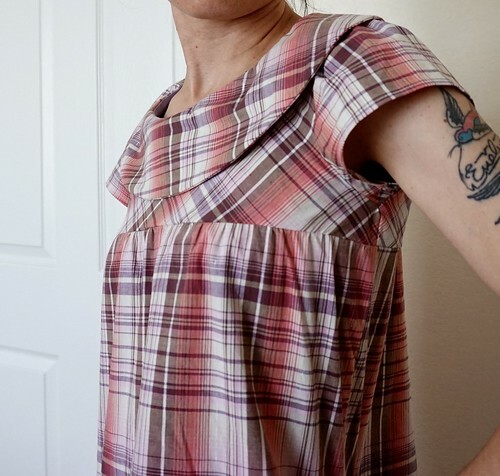 One of the blogs that really inspired me was See Kate Sew. She seemed to have a new idea everyday! It came as no surprise to me then that when she released her Garden Party collection, I had to have several of them. Since then, my design tastes have changed though, and I just am not too crazy about the patterns I chose (I mean I chose ruffles over collars, for myself). I did still want to make the Maia Blouse though, and I really liked the oversized collar, so I went for it…like a year ago. At the time, my measurements put me into a size XS. 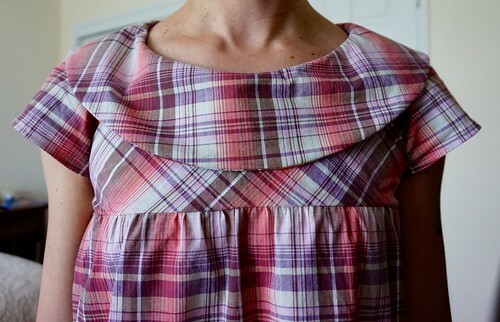 I remember making a muslin to test the high bust fit, and I liked it, so I cut into my fun plaid fabric I picked up at Discount Fabrics. I sewed up to the point where I needed an invisible zipper foot, then stopped when I realized I didn’t have one. I finally picked it up again because I’m really into finishing my works in progress, and I have since purchased an invisible zipper foot. 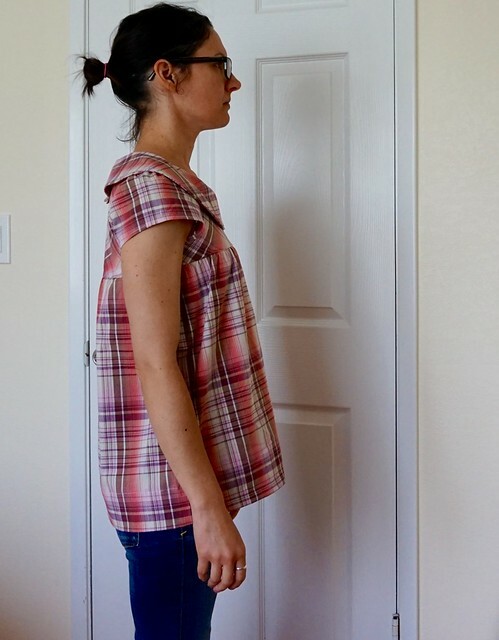 When I tried it on, it seemed just a tad on the bigger side, mostly because my current measurements now put me into a size XXS, but I could work with it. The construction is fairly simple, with the sleeves being the only issue that I can remember. The sleeves have to be eased in, which normally isn’t the problem, but the amount of ease I found a little excessive, and the way they hung down at the bottom after sewing them in, I just didn’t like. I ended up sewing a straight line from the arm pit seam 1″ up the sleeve. This removed about a triangle’s worth of fabric from the bottom of the sleeve. I had also cut the bodice fabric on the bias. I didn’t even try to pattern match it! This is very obvious though with the invisible zipper, but oh well. I also shortened it a couple of inches when I hemmed the bottom (and by the look on my face, this was very serious business). I like the way it fits mostly, but it is a tad on the bigger side. I feel like if I made the front longer it could’ve been a maternity blouse. Three years ago that would’ve made me jump for joy! I actually do like it though, I tend to be aiming more for comfort these days. My favorite part is the oversized collar. I just love it! I’m still wondering if I should do a little sleeve tuck/pleat and add a button feature. Not sure yet, but they do “bell” a little more than I like. If you like this blouse/dress pattern, or any of her other patterns, she’s having a storewide sale until Friday. 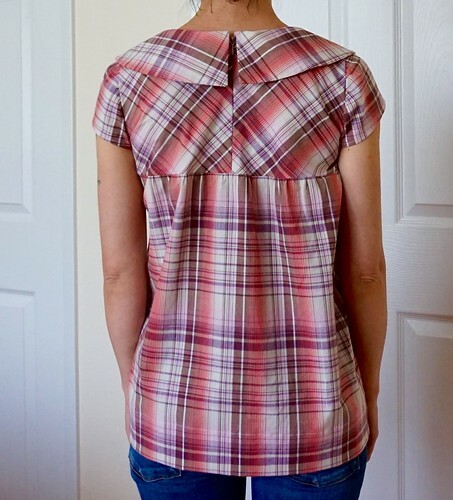 She’s also having a sew-along for her Soho Blouse for women and Manhattan Top for girls. I don’t have these patterns, but I thought I’d pass it along. Thanks, me too! I’m thinking about sticking it on another pattern!